most people cannot stick to a diet… period. MOST IMPORTANT step is ignored. To experience and enjoy… Yes, I said ENJOY :- ) … achieving your natural weight, YOU MUST address these issues… these barriers… otherwise, you will continue to sabotage yourself and never be truly successful in your weight loss desires. achieve my natural weight … AND… STAY THERE! You must find and remove … or heal… the causes of your emotional and comfort eating because they lead to overeating and weight gain. It could be simple, but obviously it’s not easy, otherwise the hundreds… or thousands … of diets that are being peddled about in the market would produce better results than a near 90% failure rate. The majority of diets and programs are not addressing the subconscious, emotional causes of eating. So, dieters continue to lose the battle. Releasing emotional reasons for overeating so that you can begin and continue to make progress. Stopping food cravings for junk food, sweets, chocolate… anything that keeps you from losing weight. Shifting your thoughts and desires around the idea of exercise. Raising your self worth and esteem so that you can begin to actually see the vision of your natural weight. Release the emotions of depression, frustration, anger and other disempowering emotions that keep the pounds on. 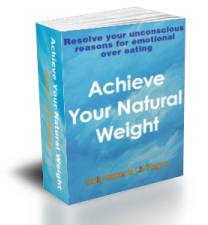 Sally Baker and Liz Hogon, professionally recognized and credentialed therapists as well as co- authors of Achieve Your Natural Weight), have not only compiled the tools necessary for you to begin to solve the problem of emotional eating, but they have put together programs to assist you along the way in Achieve Your Natural Weight. I know you’re both very expert on weight loss …, this book is truly amazing. Your readers will love this. I like the way you examine PSTEC, EFT and Hypnotherapy in turn. You then show how to use them to remove the reasons for obesity. Your book is very clear and your expertise on weight loss really shows on every page. Readers will enjoy the clear explanations and will be able to make use of them almost instantly. Including access to your video sequences, MP3 downloads and PDF resources are a brilliant addition too. Just follow the steps and “hey presto” – success should follow. Your Tap.Eat.Step approach to successful and sustained weight loss is something everyone should know about. Yours is an important new development for successful weight loss. You have come up with a new and effective way for people to achieve their natural weight, extend life expectancy and, most importantly of all, improve the quality of life too. 3 hypnotic audio tracks: Shrink Your Stomach, Anxiety Buster and Slimmer You. If you are still struggling with your weight loss challenges… whether you are dealing with a large amount of weight or only 10-30 pounds… would you feel more comfortable calling in a professional to help you along the way? Would it give you more hope to have an experienced and credentialed practitioner help you to FINALLY get the better of this weight problem? Sally and Liz are experts in this field and have not only authored this book for everyone who is struggling with weight loss issues, but they have also expanded their offering of various tools, instructions and techniques to help you FINALLY begin to get a handle on your weight loss challenges… and… they have put it together in an easy to use Member’s Area so you have private access to the basic tools to overcome emotional eating and comfort eating. “I had tried all the diets. I could not lose weight. My only course of action was surgery and a gastric band. On the recommendation of my GP, I contacted Sally Baker with a view to having a series of Hypnotherapy sessions to have a hypno-gastric band. A gastric band without the surgery. I am a naturally sceptical person and was apprehensive about submitting myself to hypnosis. A combination of the procedure, dietary advice and motivation has helped me to lose 15kg in 3 months. No starving was necessary, no post-operative side effects only the satisfaction of reducing my weight. I am very positive about a lighter, fitter future as a result of my sessions with Sally. I am very grateful to Sally for her professional help and to my GP for her recommendation. Try the therapy; you have nothing to lose but your excess weight. If you do not address the emotional reasons for over eating, emotional eating and comfort eating, then you are trying to lose weight the hard way… the unsuccessful way. We believe that you deserve to not only achieve your natural weight, but you also deserve to have all the advantages at your disposal.